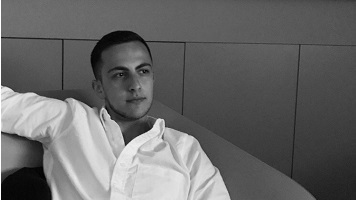 After gaining his Maths, Economics and Psychology A-Levels, Dorian Beqiri took a gap year out, as he wanted to gain work experience. During his gap year, he secured a job with Apple, which helped him build up his CV. At the same time, Dorian also undertook something quite unusual: he taught himself to start trading stocks and currencies. This interest in finance was what attracted Dorian to LSBU, with the module content of the Economics course being of particular interest. “A lot of it was mathematics based, and the second and third years involved econometrics, which I felt was an invaluable tool in bettering your skills as an undergraduate economist,” he explains. Dorian says that he volunteered to become course rep in year one as he felt that there needed to be a good line of communication between students and teaching and administrative staff. “I’ve thoroughly enjoyed undertaking this role, as I’ve been able to relay feedback on topics like module content and timetabling in the course board meetings, as well as keep a flow of dialogue going between my peers and our course director. It’s really helped improve my listening skills and my ability to negotiate. After finishing his second year on a high, Dorian started a seven-week internship with Hargreaves Lansdown, a FTSE 100 financial services firm, and was placed in the stockbroking department. “This was an extremely fast-paced environment, as most tasks had to be completed within the London Stock Exchange trading hours. During this time, I learned a lot about fund-trading and rebalancing portfolios, something which I had never had the opportunity to do before. “As part of the internship, I was given a lot of tasks that would be akin to that of a new starter with the firm, which I found to be a nice surprise. I started off learning the ins-and-outs of the software and how to manage client accounts, and by the end of the internship I was processing forms for real-time trades of various amounts every day. The skills I learned studying Economics helped me greatly when crunching numbers and percentages, as well as when formulating spreadsheets. Doran believes that the best thing about studying at LSBU is the quality of teaching, particularly due to the experiences he has had on his course. “For Economics, you are taught by individuals who are seasoned professionals in their fields, some of whom have even published books and research papers, and come from all different backgrounds. I really enjoyed the Econometrics module I did in my second year, as the coursework assessment was like a smaller-scale project on its own. It involved hours of work being put into it over several weeks, which I think motivated myself and the other students to not leave it until the last minute. In fact, it was because of this module that I chose to do Financial Econometrics in my second term this year, and I am also devising a way to base the research topic of my dissertation on an econometric model, so that I can incorporate a good level of statistical analysis into the methodology.